I didn't fully appreciate the next generation of consoles until last Friday, when I got the chance to play Skylanders: Swap Force for a couple hours on the PlayStation 4. It's not that I consider the third installment of Activision's wildly popular toys-meets-games franchise to be the pinnacle of gaming achievement or anything. I know there are more advanced games in the pipeline for the Xbox One and PlayStation 4. It's just that, with more than 100 hours clocked between the first two entries, Skylanders has become my baseline. I've not played enough Call of Duty to recognize how much of an improvement Ghosts on next-gen is over Black Ops 2 on current-gen, but as soon as the PlayStation 4 version of Swap Force started up, I knew I was looking at the future. I was eager to get my hands on the game. This was my first time, sitting on the couch in a hotel room near the Atlanta airport — members of the Swap Force team were in town for a meeting — but first, there was testing to be done. Out of my backpack I pulled several of my own Skylanders toys — I'd come prepared. I set first-generation Cynder down on the new Swap Force portal, and there she was in all her disturbingly-chesty dragon glory. Each older Skylander I placed appeared on the screen, looking more animated than ever before. Dark Spyo. Ninjini. Slam Bam. Of all the toys I brought with me, only one did not work, and that was because it was Disney Infinity's Mr. Incredible. I had to try. Into the game proper, I was first treated to a pre-rendered cutscene in which the series' villain, Invader Zim Kaos, unveils his plan to harness the power of Petrified Darkness to strike at the very heart of the Skylands, the well of power that keeps the floating islands of the world afloat. Then came an in-engine cutscene featuring Patrick Warburton's womanizing bobcat-creature, Flynn. I could barely tell the difference. ...and you know they are taken from an angle you'd never, ever see while playing, but those are indeed the graphics of the PlayStation 4 version of the game. The new engine developer Vicarious Visions used to build Swap Force just sings on next-generation hardware. What they've achieved here rivals the animated movie look and feel of the PlayStation 3 Ratchet & Clank games, which might seem like a backhanded compliment, but considering the Insomniac folks have to resort to dark magic to produce similar results, it's really quite impressive. With lush visuals and smooth framerates established, I was free to spend the next hour and a half falling in love with some fresh faces. Faces like Zoo Lou, a new normal Skylander (read: non-swapping) whose Shamanic powers include the ability to summon and ride a wild boar. Or the new Undead Skylander, Roller Brawl, also known as the Skylander my wife is most likely to cosplay as. She's a roller derby goth with pink hair. Pretty sure they created her just for my benefit. Not complaining. Aside from being my new secret girlfriend, Roller Brawl punctuates the series' new focus on creative movement. The first two Skylanders games were about running and hitting — there was no platforming, because there was no jumping. Now there is jumping. There is rolling. There is teleporting. There is bouncing. That's where those Swap Force characters come. Each is comprised of a top and bottom portion. While both are defined by their particular element — Magic, Earth, Water, Fire, Death, Tech, Life and Air — the bottom half is defined by its movement type — Teleport, Speed, Spin, Dig, etc. Held together by magnets, the Swap Force characters can change their movement types on the fly. Take Boom Jet here. ...and he's Boom Drilla, with the same bombs plus whatever Grilla Drilla's lower half does. These myriad movement types open up more than just endless platforming and combat possibilities. They also open up new mini-games, specific to each type of movement. Speedsters play an Sonic-style 3D racing game. Bouncers engage in an island-hopping jam. Spinners play a top-down, pinball/breakout mashup where they attempt to get to the center of a rotating wall of breakable objects without bouncing themselves out of the ring. 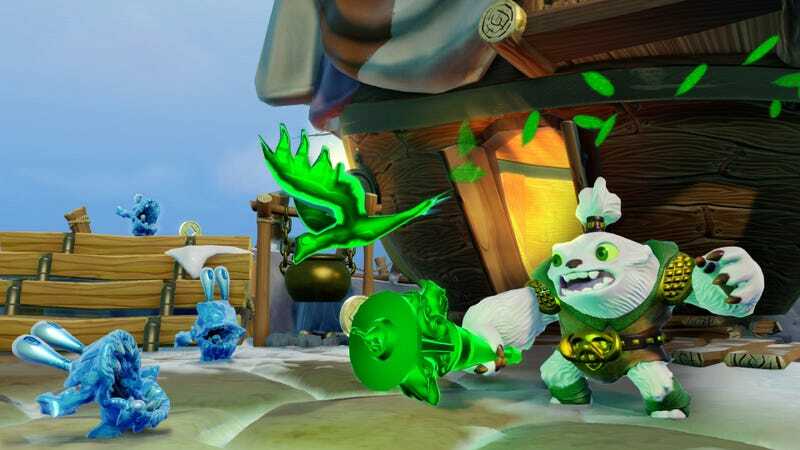 The swapping also allows for more devious mechanics — the element-specific gates from the first game that require players have a matching Skylander have been tweaked to include dual-element gates — portals requiring either one Skylander of each element, or a Swap Force Skylander encompassing both. There are more ways to get players to buy more toys in Skylanders: Swap Force, but there are also more ways to play with them. From the mini-games, which unlock in your home base to play once completed, to the wide variety of gameplay types encountered during normal play. During a level in which I was attempting to save the Ice Elves from Kaos' forces, the screen shifted to a sideways perspective so I could fire snowmen at warhips, Angry Birds style. And that was after a bout of Ratchet & Clank-flavored rail grinding. Skylanders: Swap Force is a joy to play so far, and on the PlayStation 4 it's a simply gorgeous joy to boot. So much so that I am actually dreading the game's October 13 release on the Xbox 360, PlayStation 3 and Wii U. The gameplay and charm will be in place, but the real party isn't starting until November 15.